Tim Pigott-Smith reads this gripping novelisation of a classic Doctor Who adventure. Forced off course by the Mandragora Helix, the TARDIS lands in the province of San Martino in fifteenth-century Italy. Here, the court astrologer, Hieronymous, has been taken over by the Mandragora energy-form �Hieronymous and the other members of his star-worshipping black magic cult will be used as a bridgehead, enabling the Mandragora Helix to conquer the Earth and rule it through their chosen servants. 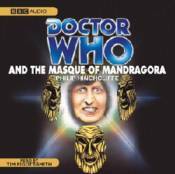 The Doctor has to defeat not only the Mandragora energy, but the evil schemes of the murderous Count Frederico who plans to usurp the place of his nephew, the rightful ruler of the province. Tim Pigott-Smith reads Philip Hinchcliffe�s complete and unabridged novelisation, first published by Target Books in 1977.